Are you running or in charge of running a business with multiple employees? If you are then you are well aware of the complications and variable factors that often tend to creep in to play when you are trying to create the schedules. The 9 to 5 Work Schedule Template is available for free on this page to help take out some of the headache in your job. If you have too many employees scheduled you run up your costs whereas you don’t have enough employees you can run away your potential profits. This is what was kept in mind when we created the 9 to 5 Work Schedule Template that can easily be downloaded for free on this page by just clicking the button. The template is also customizable to flex with your business needs. The 9 to 5 Work Schedule Template is broken into 3 different sheets. The schedule sheet gives the names of the employees and shows how they are scheduled for the day. By default the list is broken into how each employee interacts with the job that day. Are they working a Full Day; Half Day (Morning or Afternoon); on Vacation (Paid or Unpaid); Medical Leave (Paid or Unpaid); or something else that is not described? This in turn will break down the total number of hours worked and based on the employees pay will break down the Total Labor Costs. 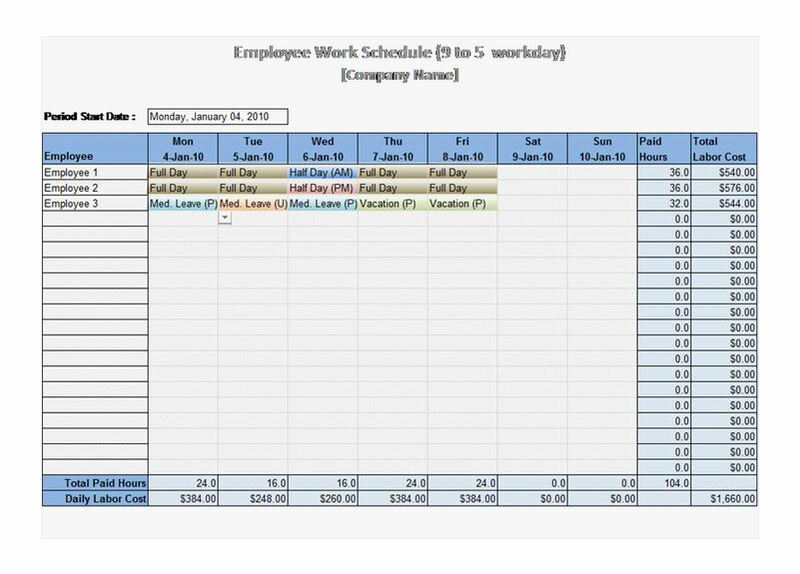 The 9 to 5 Work Schedule Template also has a shifts sheet gives a more in depth description of what each of the descriptions listed in the previous page are. For example, the template lists Full Day Work is 9am to 5pm with 8 hours being paid; the Half Day AM is classified as 9am to 1pm with 4 hours being paid; etc. Again these variables are easily changed on the template and there are instructions on what additional steps need to be taken if they are changed clearly marked directly on each sheet. The last sheet on the 9 to 5 Work Schedule Template is the employees. This is how the costs again are generated on the first sheet. The pay for each employee, listed on this sheet, multiplied by the number of hours worked will generate the total labor costs for that day and allow you to easily schedule your employees. Download this free template today and customize it to work best for your business.